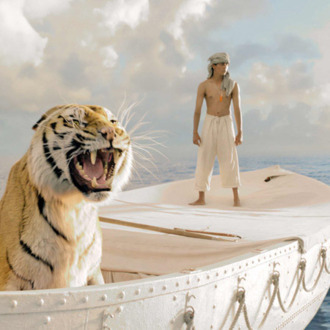 Oscar Futures: Can We Count On Life of Pi? Photo: Twentieth Century Fox Film Corporation. Ang Lee’s 3-D epic screened today in advance of its NYFF premiere and received mostly rapturous raves (with a few dissenters). It ain’t fair, but the New York Post ran a random test screening report that wasn’t kind to the film (“My biggest issue with the film as a whole was, it was boring”) and will pollute the water until real reviews run. Malick’s latest was hit by mixed to negative reviews on the fest circuit, and though it got distribution this week, it won’t come out till next year. Bernie was the first film this awards season to send out screeners, which will put more eyes on Jack Black’s deft performance. Curve opened below expectations at the box office, and its impact on awards season is already fading. he nascent A24 Films announced that they’ll be waging an aggressive Best Actress campaign for Fanning, but with Quvenzhane Wallis already looking like a lock, is the category big enough for two youngsters? She’s been well-reviewed, but the movie has gotten a very rocky reception. Consensus is building among pundits that De Niro’s engaged performance is likely to send him into the top five. The party buzz is fading from the summer, as fall heavyweights enter the fray. He’ll have to remind voters how great he was by campaigning. The Emmy win helps, just as Melissa McCarthy’s Emmy win once presaged her Bridesmaids nomination. Awards voters love Maggie in this mode. Les Miz has plenty of supporting females that could crowd this category, but it’s become conspicuous that Bonham Carter’s comic relief character hasn’t appeared in any marketing materials at all.